Are you a writer or are you an aspiring writer? How do you define yourself? This is the controversial question we tackle today. If you are looking for a heated topic among writers, just ask this question: “At what point do you start calling yourself a writer?” That’s the question Robyn Petrik blogged about, then put to the Writing Resources Community. That is when I realized how varying are the opinions on this topic. So let’s begin by recognizing that there is plenty of room for everybody’s opinions, and that mine will be very clearly articulated below – and you should feel free to agree or disagree in the comments at the end of the post. Sound familiar? Then you are not alone. So when do you call yourself a writer? When you publish your first book? When the first book actually sells? When somebody other than your mother buys a copy (that might be the 40th copy)? When you sell enough books to cover the cost of publishing? When you actually sell enough books to cover the cost of publishing and pay a reasonable wage for the time you spent researching, writing and marketing? Does selling a book make you more of a writer than if you never sell? Or does it just make you more of a salesperson? What if you never want to write a book? What if you write newsletters or blogs or marketing materials or speeches? Are you a writer? What if you write short stories, but never publish them – you write just for the joy of writing. Are you a writer? As you can tell, I pretty strongly disagree with this view, and my reasoning has nothing to do with writing; my reasoning has to do with my view of a person’s identity. To put it simply: don’t let anybody else define who you are. Yes, that pretty much sums up my position on the matter. As soon as you define “writer” as somebody paid to write, you saying that other people get to define who and what you are. Allow me to give an example. Let’s say Patrick is working on a screenplay, but he can’t seem to knock on the right doors or find a producer who is interested. But by golly, Patrick still needs to eat. He needs a roof over his head. He needs clothes on his back. So he moves furniture to earn the money he needs to pay for food, shelter and clothing, after all. POP QUIZ: Is Patrick a writer or a furniture mover? If you follow the logic that you are a writer only if you are paid to be a writer, then the corollary is that you are a furniture mover if you are paid to move furniture. But wait. Let’s look a little closer at what is really happening here. Patrick writes to write. He hopes to make money from his writing, but that’s not his motivation. He writes because he is a … wait for it … a writer! Patrick moves furniture to eat. And to keep out of the rain. And to avoid violating public decency laws. He needs to make money, that’s his motivation. He moves furniture because he is an … wait for it … an eater! And … wait for it … a dweller. And … you know what to do … a non-nudist. And he is a writer. The problem with calling Patrick a furniture mover is that “furniture mover” does not define what or who he is, but what other people are willing to pay him to do. Mrs. Jones of 24 Caramel Lane simply does not need his lovely screenplay today. But she sure needs someone to move her furniture. Her needs are not what defines who Patrick is; they only define what she is willing to part with her money for. Getting paid to write doesn’t make a person a writer. 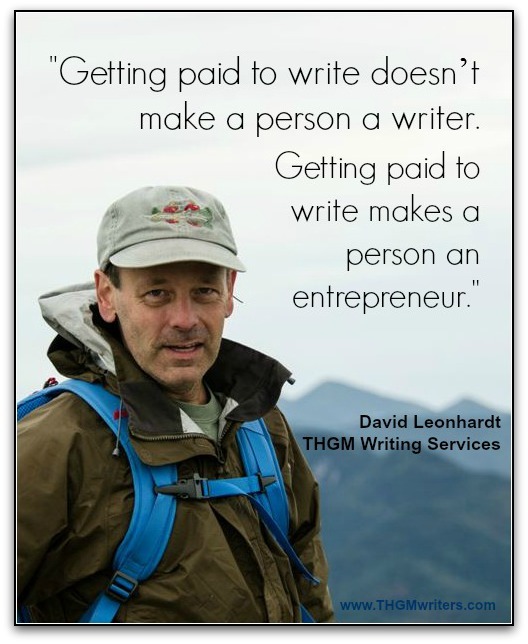 Getting paid to write makes a person an entrepreneur. When it comes to definitions, there is plenty of room for honest disagreement. But I’ve been a writer since I wrote for my high school newspaper, becoming co-editor in my senior year. I have been a writer of poems and song lyrics on nobody’s payroll. I have since become a published author and a prolific blogger. I ghostwrite articles and I have written reports and news releases as an employee and as a freelancer. I think I have been many writers. Are you a writer? What are your thoughts on this? Great article David! I am a writer because my ideas are solid and need to be expressed. SO…this is an interesting topic. I get paid to write. But I also think of myself as a writer. I enjoy writing. It’s who I am. And even though I get paid to write, I also do other writing (some of it secret and very, very bad fiction) that I am not paid for. The subject of whether or not to identify yourself as a “writer” is fraught with complications, not the least of which is how others will respond to you if you do so. Personally, I do not identify myself as a writer. If the subject of how I fill my time comes up I respond truthfully telling them of the multitude of hours I spend right here, writing. If you tell others you are a writer they will, unfortunately, scoff, if not verbally probably internally. Tom, this is not my experience. I do writing and I do website promotion. I find it so much easier to say that I am a writer, because people seem to understand and respect that. I say “I’m a writer for (insert the most high profile name you can think of) and a bunch of other publications.” I add that last bit “and a bunch of other publications” so convey that I’m a man about town and not a one trick pony etc. I figure it’s about being memorable, making an impression. So much of life is that way anyway, declaring one’s vocation should follow the same best practice. I say that a lot, too. I say “I’m a writer for X and a number of other web sites.” Adding that really does seem to raise your stock. If you can mention a publication/web site that others recognize, then it adds legitimacy. I guess while you might THINK of yourself as a writer, many of us also like to be thought of as the “successful” type, not the “starving artist” type. This does help a writer sell himself out on the market. I make the distinction between being a writer and marketing yourself as a writer. When we market ourselves, we need to sound as impressive as possible. I am a writer because I have to write. It’s in my blood. It’s who I am. When a story is swirling around in my mind it demands to be written. If that isn’t a writer than I don’t know what is. I’ve written two novels and am working on my third, have written short stories and ten or so children’s books (years ago). My most recent novel is in a few agents hands… still waiting to hear. Just because I haven’t yet reached my publishing goal doesn’t mean I’m not a writer, that’s absurd. I never understood the term “aspiring”. I wished they’d change that to something else like published author or unpublished author. In my opinion, if you’ve “authored” one, two, three novels you ARE an author, too. But that’s a subject for a whole other day. Great article, David. I very much relate to your definition of “writer”. I still hesitate to call myself a writer to other people because I’m not paid for it, even though I have felt the COMPULSION to write since I was a kid – it’s how I process everything. I am more comfortable calling myself a “blogger”, I guess because it has more casual connotations. But writing matters to me, and I know that, at my core, I am a writer. I do think a writer must also be someone who writes. Sounds silly to say it… but I have friends who WANT to be writers, who love the idea of writing, who read about writing obsessively… but who do very little actual writing. Maybe they’re “potential writers”. Or “writers-to-be”. Getting paid to write makes you a professional writer, just like getting paid to eat makes you a professional eater. Do you write? Do you consider yourself a writer? Than you are. Ah, the age-old question. When one endeavors to compete in a field where there is no certifying authority…. What makes a doctor? Is it someone who obtained training to be able to provide solutions and therapy? or the person who elects to think he can help others. The difference between the two is the “alternative” therapeutics and, more typically, the quacks who espouse facts never in evidence, but always with anecdotal concept. Or, what makes an engineer? Do you really want someone who did not obtain the proper training and experience to build that 200 floor office building or that bridge? A doctor is someone who docts, obviously. On a more serious note, a doctor is someone who heals. The best adjective for him might be healer. And, yes, many people without degrees in medicine are healers in a number of different ways. Many. many people are teachers, but we only hire in our schools those who have undergone certain training that aligns their teaching with what is needed in the school system. A “doctor” is simply a word for healers with special training. There is no word that I can think of for a writer with special training. That is because, as you noted about the “fewer downsides”, there is no need for special training to become a writer. Love, love, love this post! Yes I have gotten paid to write…but I didn’t think that that was what made me a writer. What makes me a writer is that it is the one thing that I would lovingly do for FREE! Haha, nice one Dave. Without a doubt you showed the different side of the coin. Analogy is not a fact, but same things apply – if you are a blogger doesn’t mean that you are an SEO or web developer. Writing is an art, though I have to say that many bloggers totally beat up most journalist in major newspapers. Michelle, in my humble opinion, you are doing it right. “Write when inspired!” That’s my motto. If your blog is a business, then there are other considerations, fair enough. But the writing makes you a writer, the business makes you an entrepreneur. Hello David! I completely agree with your definition of a writer. The only person who can define who I am is me, and I am a writer. My first book, The Basement was published August 2013, but before then I still considered myself a writer. Writing is what I love to do and it’s what I feel most at home doing. Like you, I’ve been writing short stories and articles since high school. Thank you for the great article! I totally agree with this statement, David. Well, it felt like it would snow here this morning, too. Sure was a nice two-week summer while it lasted. This is very interesting topic. I do call myself writer because the work I do includes so much writing. I studied journalism and every now and then I do work in newspapers. And when I don’t I blog and help startups with social media and public relations which also includes writing. So I spend my days writing some kind of content and also get paid for it. So I think that you can call yourself a writer only when you are publishing a book. I also think that you can call yourself a writer when you are starting to write your book or when you are starting your own writing business. So you don’t have to get any income yet, but you are going to get paid for it later (hopefully).